President Muhammadu Buhari has left Abuja for New York, United States ahead of the 71st session of the United Nations General Assembly. 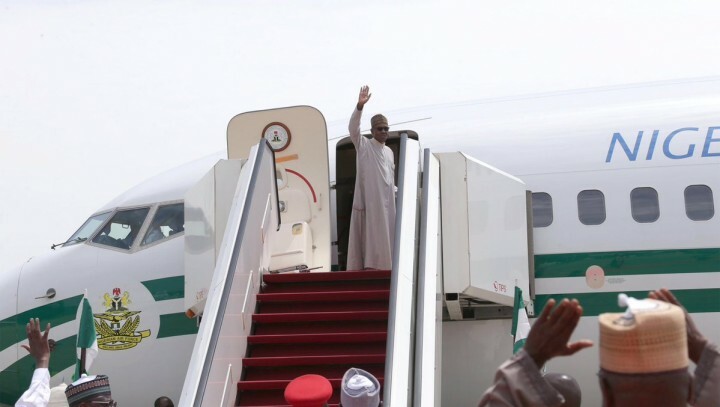 The President who departed Nnamdi Azikiwe International Airport at about 11 o’clock Saturday morning was seen of by Minister of FCT MUhammad Musa Bello and other senior government officials. The President will also attend series of high level meetings of significant interest to Nigeria and lead discussions at the United States – Africa Business Forum devoted to Investment opportunities in Nigeria. In the same vein, Minister of Foreign Affairs Geoffery Onyeama, at a media interactive session he held at the United Nations Headquarters, New York revealed to journalists that the President will signs the Paris Treaty on Climate during the cause of the 71st UN General Assembly . Some of the world leaders including President Barrack Obama of America & his Chinese counterpart had already signed the Treaty. According to the Minister, top on Nigerian UN agenda during the General Assembly is to engage African Union and other countries to work towards the reform of the United Nations, to be more democratic and responsive to the needs of the world. In addition to the wave of change, Nigeria will like to propose to the UN body to create an Agency dedicated for the youth. As the UN prepares to elect a new Secretary General, Onyeama assured the international community that Nigeria will support a new Secretary General that will be Development and Africa friendly, as well as sympathetic to the course of Nigeria. while responding on questions on investment, power and insecurity, the Minster said the government has established various security mechanisms to create attractive investment environment for would be investors. He added that with the fall in oil price, Nigeria is looking into diversification of its economy towards agriculture and solid minerals. It is expected that there will be a lot of investment opportunity for foreign investors during the US-Africa Business Forum, scheduled to take place next week in New York. Nigeria has been invited as one of the focal countries whose economies search light is beamed on. The Minister responded to various questions on poverty, migration, human right, terrorism & security ( BokoHaram), and other challenges the country is facing in retrieving the Abacha’s loot and other Nigeria’s assets stashed abroad. President Buhari is being accompanied by Governor AbdulAziz Yari of Zamfara State and his Lagos State Counterpart Akinwunmi Ambode, Ministers and Some members of the National Assembly. Here he goes again. Buhari is once again on oversea trip rather than sit back at home and find lasting solution to the near insurmountable problems Nigerians face at home. His appearance or non appearance at the UN assembly will change nothing. I mean nothing absolutely will change. May be he’s going for a clandestine medical recharge at taxpayer’s expense once again.